Will Google pass Apple as most valuable company? 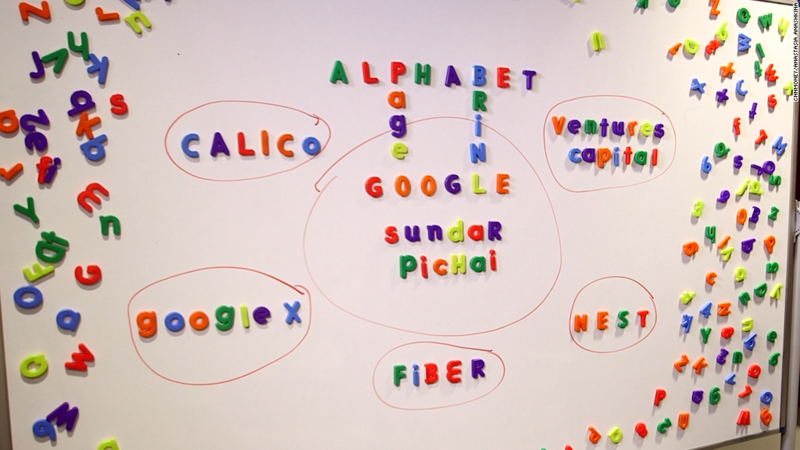 Will Alphabet pass Apple in the race to become a trillion dollar company next year? It wasn't that long ago that many investors assumed Apple (AAPL) would get there first. At its peak price earlier this year, Apple had a market value of nearly $775 billion. Alphabet, which I'm now going to refer to as Google (GOOGL) for the rest of this story, was worth $366 billion at the time. But Apple's stock has plunged from its highs in recent months due to fears that iPhone sales are slowing -- in part due to the popularity of smartphones that run on Google's Android operating system. 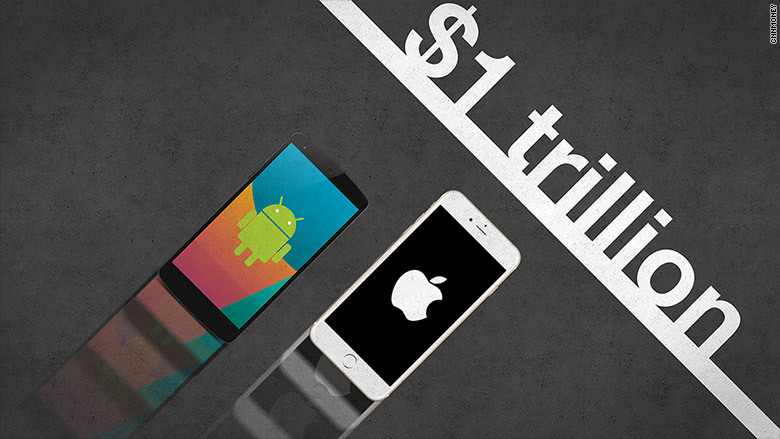 Apple is still the world's most valuable company. But Google is nipping at its heels. Apple's market value is currently $605 billion while Google is worth $527 billion. Sure, a nearly $80 billion gap may still sound like a lot. But it's not really. Google only needs to go up 15% to beat Apple's current valuation -- provided that Apple stands still, of course. Google has more momentum right now. The stock is up 43% this year while Apple's shares are down 2%. Google's search business is thriving, particularly on mobile devices. And Google is getting more and more revenue from YouTube. Analysts think Google's profits will grow at a much faster rate than Apple's as well. Wall Street is forecasting that earnings per share for Google will be up 17% a year, on average, over the next few years compared to a projected annual growth rate of 12%. All estimates cited in this story are from FactSet Research. So let's say, for the sake of argument, that Google continues to outperform Apple next year. If Google's stock rises 25% and Apple's bounces back by about 5%, then Google's market value would top Apple's. And if the companies put up similar performances as this year, Google would be worth more than $750 billion and Apple would have a market value of about $590 billion. Does this mean Google will beat Apple to the 12-zero mark? It will if its stock keeps climbing at this pace next year and 2017. Of course, that's not likely. It may be tough for Google to match this year's run since it is now a bit expensive, trading at 22 times earnings estimates for 2016. Apple, on the other hand, is trading for only 11 times profit projections for fiscal 2016. With that in mind, it shouldn't be a huge surprise that analysts are predicting a comeback year for Apple in 2016. The consensus price target for Google is $849.70 -- 11% higher than now. At that price, Google's market value would be about $585 billion. Wall Street's average price target for Apple is $146.05. That's a 35% increase -- and it would give Apple a market value of more than $815 billion. So the market cap race between Apple and Google will be fun to watch in 2016. And beyond. Then again, maybe neither of these companies will hit $1 trillion first. Amazon (AMZN) and Facebook (FB) have quickly amassed $300 billion market valuations after all. And you can't forget that grizzled tech veteran Microsoft (MSFT) either. Its market value is now about $450 billion. But what do you think? Will Google pass Apple next year? Vote in my Twitter poll. Writing story about Apple and Google (Alphabet) for tomorrow. Who will finish 2016 with higher market value?